For a general brochure of products and information, please download here. Floating floor systems consist of a secondary concrete slab, floating above the structural slab on a resilient element. 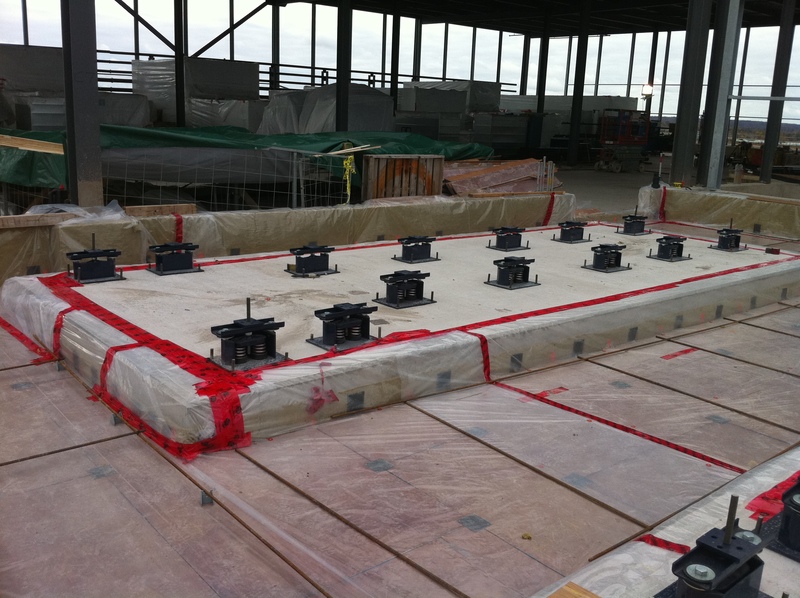 Tecoustics provides design, supply and installation of floating floor systems utilizing neoprene, natural rubber, spring elements or air bags as the resilient support types. For more information on Mason floating floor systems, download the bulletin here, or visit our floating floor page. There are many architectural acoustic and vibratory considerations which extend beyond that of a floating floor, and outside of a mechanical room. Tecoustics carries a full range of product solutions extending from spring hangers for acoustical ceilings, to building isolation. Walls are isolated to prevent flanking around floating floor slabs or to improve the STC between adjacent spaces. The best approach is to rest these walls on the perimeter of the floating floor, so the floor isolation system serves the walls as well. Sway bracing, floor and ceiling treatments are required to properly isolate the wall system. For more information on wall isolation systems, please download the brochure here. There are two types of resiliently suspended ceilings. Lightweight Mechanical Ceilings, with light fixtures and air conditioning outlets etc, and Acoustical Barrier Ceilings, which are used to reduce noise transmission from the floor above. In either case, isolation hangers should be used to suspend the ceilings. The predicted results based on hanger deflections are much more difficult to evaluate compared to spring or rubber equipment mountings that rest on a structural floor. Due to this inconsistency, our recommendations are always to use the best spring products for the suspended ceiling applications because the additional cost is low compared to the risk of poor performance. Hanger cost is a small percentage of an acoustical ceiling and it is the most important that these sensitive systems are installed with the very best chance of success. For more information on acoustical ceiling products, please download the brochure here. Noise and vibration isolators are used to prevent the transmission of vibration from one source to another. Ground vibration may be generated by above ground or underground freight trains or heavy motorized vehicles such as trucks or military equipment. Other noise sources could be industrial hammers, power plants or industrial machines, close enough to an adjacent building to cause a problem. Tecoustics offers custom building isolation solutions from Bridge Bearing Neoprene or Spring supports for the building foundation, to custom rubber or spring mounts for structural isolation applications. For more information on building isolation, please download the bulletin here. Please contact us for more information on any of the above systems or services. Please see here for architectural resource downloads.